Superman wasn’t born on Krypton. He was born in Cleveland. So were Jerry Siegel and Joe Shuster. Siegel was a fan of movies, comic strips, and science fiction pulp magazines. He became active in what would become known as fandom, corresponding with other science fiction fans. In1929, Siegel published what might have been the first SF fanzine, Cosmic Stories, which he produced with a manual typewriter and advertised in the classified section of Science Wonder Stories. Siegel live in this house at 10622 Kimberly Ave. in Cleveland’s Glenville neighborhood. 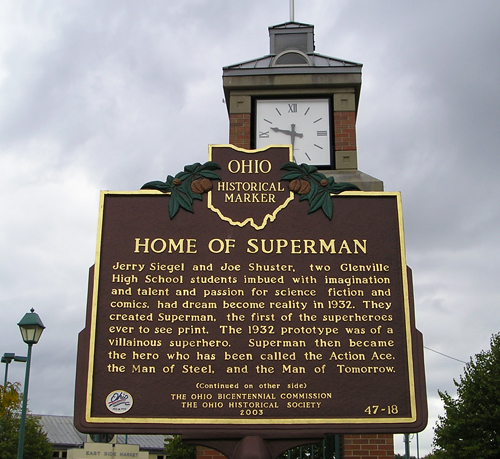 While attending Glenville High School in Cleveland in early 1933, Jerry Siegel wrote a short story, illustrated by his friend and classmate Joe Shuster, titled “The Reign of the Superman”, which Siegel self-published in his fanzine, Science Fiction #3. Originally Superman was a villain but in June 1933 Siegel developed a new character, also named Superman, but now a heroic character. This was a journalist named Clark Kent who pretended to be meek and mild-mannered but was secretly the mighty Superman. He was enamored with Lois Lane, but she scorned Clark Kent and was attracted to Superman, not knowing that Kent and Superman were the same person. 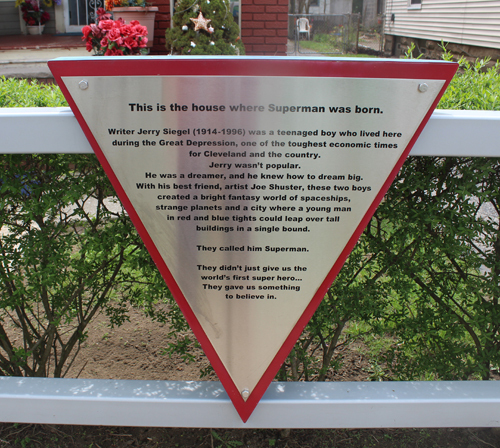 There is a plaque commemorating the creation of Superman in their Glenville neighborhood. It is located at the corner of East 105th and St. Clair Ave. The homes of Siegel and Shuster are within a mile of the marker. “This is the house where Superman was born,” reads a sign hanging on the fence in front of 10622 Kimberly Ave. It’s a private home. 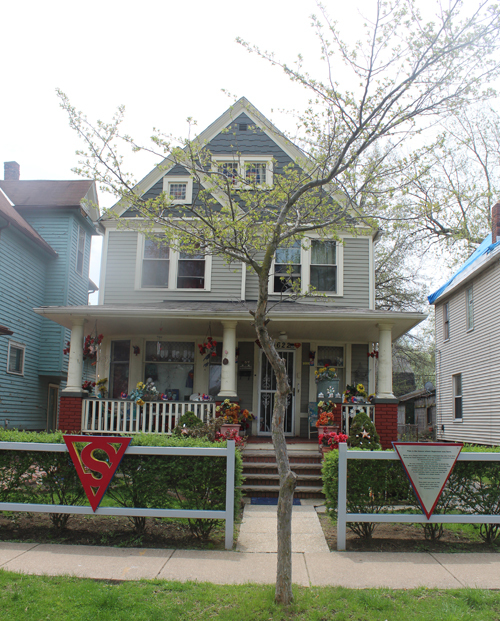 The apartment house where the Shuster family lived is now a vacant lot, but the fence around it has been hung with 2×3-foot metal panels that reproduce the cover and first 13 pages of Action Comics #1, the first Superman story, which was published on April 18, 1938. 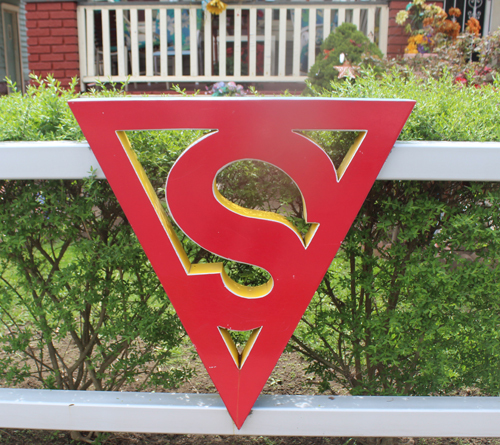 The street signs for the neighborhood feature the Superman insignia, and an honorary name paired with the actual name of each street. 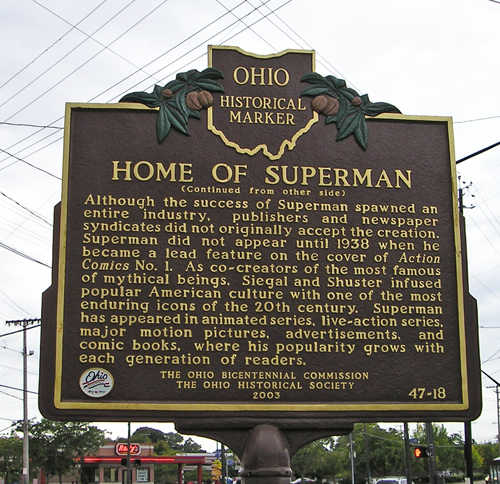 You can stand at the corner of Joe Shuster Lane and Lois Lane. 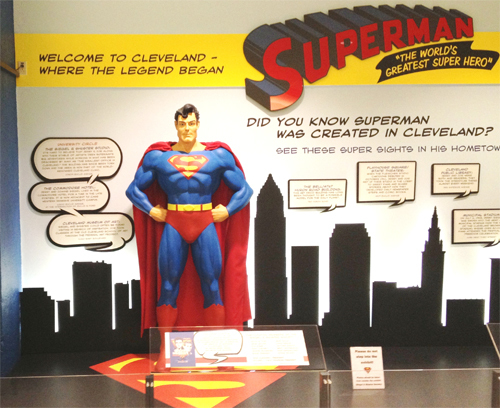 There is also a Superman statue and display at Cleveland Hopkins Airport.